In 1977, researcher Bill Ballantine got the New Zealand government to declare a five square kilometer (two sq. mile) patch of sea near his laboratory as a marine reserve, so he could study the effects of excluding fishers. For ten years after that, not much happened. The bare, trawled seabed slowly started to re-grow its kelp. And finally, by the late 1990s, the local populations of snappers, red moki and blue cod were six times higher than in surrounding areas. Local lobster fishermen ringed the little reserve with traps, as catches beside it were so good. A slightly larger experiment, involving 11 km. (7 miles) of coastline in St. Lucia, started in 1995. It happened as a compromise in a fight between local fishing families and tourist companies. The tourist companies said that fishermen caught so much that it was ruining the scuba diving tour business. The fisher families said they were impoverished for lack of fish. The small protected area was somewhere between what either side could tolerate. Again it took some years before any change happened. But by 2002, the counts of groupers, snappers, grunts, surgeonfish, and parrot fish rose to about five-fold the levels found in surrounding waters. Local fishers near the reserve reported catching more fish, and they were bigger fish. The fishing families started praising the reserve, and the diving tour business improved. As populations of salmon, tuna, and rockfish fell on North America’s Pacific coast, Oregon recently (in 2012) designated three small areas as off-limits to fishing. These zones, around Cape Falcon, Cascade Head, and Cape Perpetua, totaled about 77 square miles of seabed, which was around 9% of the state’s offshore territory. 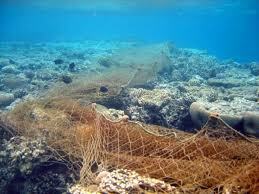 Perhaps the remaining seabed was trawled for fish even more heavily than before. But if the small sardines, herring, and smelt have some safe havens for spawning, then they might provide more food for the salmon or tuna. 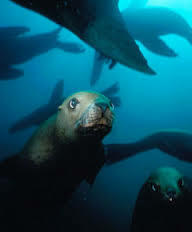 And if there’s more food in the sea, maybe the sea lions will feel less inclined to attack fishing boats in port, trying to steal back the catch. Having a few sea sanctuaries could be more effective than legislating to restrict catches of certain fish species by indiscriminate fishing nets, because these tiny marine preserves could act like savings accounts for all the creatures in the sea. Just when it seemed too late for the world’s fisheries, the idea of marine wildlife preserves started to take off. In 2006, the US government announced a Papahanamokuakea Marine National Monument, which covers 90,000 square miles near the Hawaiian Islands. And somehow this helped set off an international competition. The tiny Pacific nation of Kiribati outdid the USA, announcing it would protect 154,000 square miles of undersea paradise around the Phoenix Islands. In 2009, Australia trumped that by declaring a Coral Sea Conservation Zone of over 600,000 square miles, stretching seaward toward the east from the Great Barrier Reef. In the same year, the USA protected three major coral reef regions: the Pacific Remote Islands Marine National Monument (with seven island areas totaling over 77,000 square miles), the Rose Atoll Marine National Monument (over 13,000 square miles, in American Samoa) and the Marianas Trench Marine National Monument (with over 95,000 square miles). The Pacific island nations were not to be outdone. 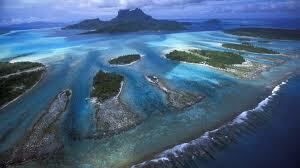 In 2009, Palau designated 230,000 square miles of ocean as the world’s first officially designated shark park. And by 2011, Micronesia, the Marshall Islands, and Guam joined Palau in forming a trans-national protected area of two million square miles. That was fully half the size of the old hydrogen bomb test exclusion zone, which the USA imposed around the Marshall Islands in the 1950s. Now the Marshall Islands took bragging rights by contributing 768,000 square miles to the big protected area, and claiming its title as owner of the world’s biggest shark sanctuary. Meanwhile, the Pacific nation of Tokelau earned an honorable mention with a new 123,000 square mile park. In announcing this at a meeting of Pacific Island nations, Tokelau leader Ulu Toloa explained, “Tokelau lies at the heart of the Pacific Ocean and the Oceanscape. We Tokelauans—in common with Polynesians, Micronesians and Melanesians—and in common with species such as the humpback whale or the hawksbill turtle or the great white shark—are Pacific Voyagers and the ocean is, quite simply, our home” (Conservation International, 2011, September 12). Of course it was hard for Palau, the Marshall Islands, or Tokelau to enforce their limits on fishing in these vast areas. People could easily ask “Protected from what?” And that was hard to answer, not only due to doubtful enforcement, but also because the protected zones had varying levels protection. They were more like zones of “managed use” such as US national forests, than real national parks. However, while the world fishing fleets have been taking around 100 million sharks a year in a race to extinction, the sharks of the shark parks have gained a value beyond the price of their prestigious fins. In Palau, the Australian Institute of Marine Science calculated that each live shark earns the country $179,000 (US) per year in tourism dollars, or about $1.9 million over the average lifetime of each shark. That compared to a market price of $108 for each dead shark on the shark-fin soup market (Pew Environmental Group, 2011, May 2). It seemed the shark park was at least a thousand times better for business that the shark fishery. Following Palau, Honduras, the Bahamas, and the Maldive Islands (in the Indian Ocean) jumped on the shark sanctuary curve. South Africa designated 18% of its coastal waters as marine reserves. Even the UK got in on the action, protecting about 250,000 square miles around the Chagos Islands in the Indian Ocean. The shark parks showed a fairly steep slope of rising profits in many previously remote locations. In Belize, the town of Placencia recently made $3.7 million off tourists coming to watch whale sharks swim by. The numbers of whale shark tourists in the Donsol region of the Philippines rose from 867 in 2000, to about 7,000 by 2005. In the Canary Islands, one third of all recent diving activity has concerned shark and ray viewing. In South Africa, probably most shark watching is done by the shark lookouts who signal bathers when to evacuate the sea near Cape Town. But people are paying to see the great whites up close at Kim Maclean’s “Shark Lady Adventures,” with its ad line of “This time, it’s you in the zoo” (Eilperin, 2011, 234–235, 245–246). The year 2012 was even more eventful for sea sanctuaries. In June, Australia declared a new network of 33 marine reserves off all shores of the continent, which totaled nearly 730,000 square miles. New Caledonia went for a 540,000 square mile park. Then French Polynesia linked six previously designated shark sanctuaries into a gigantic of 1.8 million square mile preserve. And in December, word came that the Cook Islands had declared a 730,000 square mile marine park, which was contiguous with the one just established by French Polynesia. The two areas joined together totaled over 2.5 million square miles, which is almost the size of the Australian continent. All this fit into an initiative endorsed by 15 Pacific nations, known as Pacific Oceanscape. The idea is to piece together contiguous marine protected zones across the Pacific, eventually to include 40 million square kilometers, which is approximately the surface area of the moon. One of the spokesmen for this initiative, former rugby star Kevin Ito, explained that he saw Pacific Oceanscape as simply an extension of the traditional “raui” system that Cook Islanders used to protect their fishing grounds in the past: “The chiefs would come in and say ‘we won’t fish this area anymore, I’m putting a raui on it and no one can touch it until the stocks regenerate.’ Everyone in the Cook Islands grows up knowing why the raui’s put in place and they won’t fish there until it’s lifted. This marine park thing is basically the same but an expanded version.” Peter Seligmann, of Conservation International, added “What we are seeing is the largest conservation initiative in history. Piece by piece, nation by nation, it’s coming together. It’s massive” (Sands, 2012, September 19). Hopefully, this account will be hopelessly out of date by the time you read this. All these underwater parks look still look like a few random spots on the world map. But the total of “protected” ocean areas as of January 1, 2013, was well over six million square miles, out of about 139 million square miles in the whole global ocean. That’s getting to over 4% of the sea. It’s a fair area for sharks, whales, and tuna to play in, so long as the poacher fishing fleets can be excluded. Overall, it’s considerably behind the slow progress of conservation on land, but fish have to breed somewhere. And like most African nations with their game parks, oceanside countries everywhere are comparing the value of living creatures to the price of dead meat. If we can just stop the rising acidity of the whole ocean due to absorption of excess CO2 before it kills the coral reefs, we might have something. 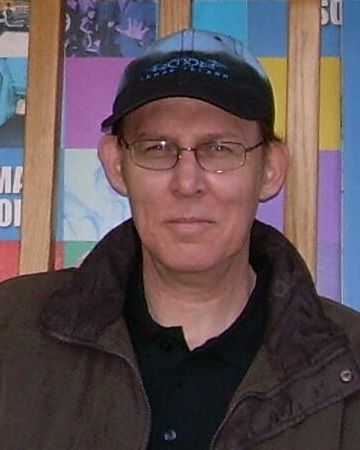 Based on portions of the upcoming book Animal Wars: Our Battles, Truces, and Alliances with the Beasts, by Brian Griffith, to be published in Spring, 2014, by the Exterminating Angel Press. 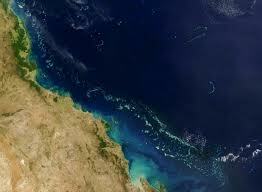 BBC News (2012) “Australia to Create World’s Largest Marine Preserve.” June 13. BBC News (2012) “Cook Islands’ Shark Sanctuary Creates World’s Largest.” December 13. Future of Pacific Oceanscape.” September 12. Eilperin, Juliet (2011) Demon Fish: Travels Through the Hidden World of Sharks. Pantheon Books, New York, pp. 234–35, 245–46. Fraser, Caroline (2009) Rewilding the World: Dispatches from the Conservation Revolution. Picador, New York, p. 37. Leahy, Stephen (2012) “Tiny Pacific Island Nations Create World’s Largest Marine Parks.” The (Manchester) Guardian, August 20. Roberts, Callum (2007) The Unnatural History of the Sea, IslandPress, Washington, pp. 354–358. Sands, Neil (2012) “Marine Park ‘the Size of the Moon’ Takes Shape in the Pacific.” AFP, September 19. I am starved for good-news stories. Thank you.